Seattle’s beloved outdoor gear co-op, REI has submitted designs for review to the City of Bellevue for its new campus in the Spring District. If all goes well, REI would officially open the new headquarters in 2020 between Highway 520 and Bel-Red Road. 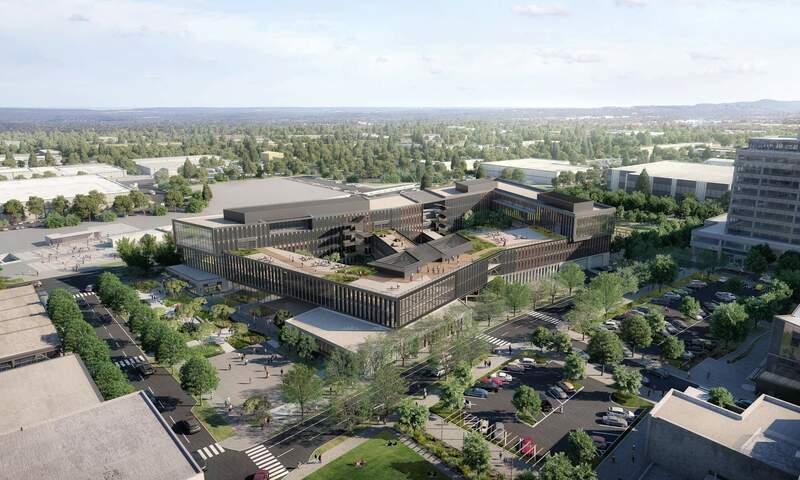 The proposed design includes 400,000 square feet in three buildings to house offices, a marketplace that would be open to the public and a meeting area/fitness center, according to REI. The outdoor space will allow the public to move across the campus on a series of three public pedestrian paths, linking nearby transit and residential areas. The space may also include public amenities such as a retail location, coffee shops and food options. Lucky for co-op employees, the building will feature connector bridges that span across the courtyard spaces, outdoor staircases, rooftop walkways and outdoor meeting spaces, offering alternate ways for employees to get around campus. There will also be outdoor space for employees to exercise and host community events and even an edible garden with native vegetation. REI has big plans to keep the construction of the new campus aligned with its environmentally conscious mission. The building is positioned for optimal solar orientation, windows will be strategically placed to maximize daylight in the workplace, and energy efficient features will be incorporated throughout the building. REI and its partners will follow LEED green building evaluation criteria. REI currently has more than 1.1 million square feet of LEED-certified buildings, including the co-op’s newest distribution center in Arizona, which achieved LEED Platinum status and is the most sustainable distribution center in the country. The co-op will also use Salmon Safe land management practices as a guideline for environmental impact to local watersheds. Additionally, REI is working with the City of Bellevue, King County and other partners to increase commuting options in Bellevue and throughout the Puget Sound region. The co-op supported Proposition 1 (also known as Sound Transit 3) last year, and continues to work with local government and community leaders to improve bike connectivity throughout the region. Will you be biking to your new job at REI in 2020? If the design is approved, the new campus sounds like it will be a great place to work.